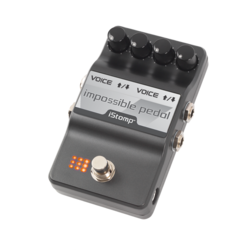 Adrian Belew and DigiTech have teamed up to bring you a guitar effect unlike any other, The Impossible Pedal. As its name implies, The Impossible Pedal lets you play impossible guitar riffs that you would never think to play. 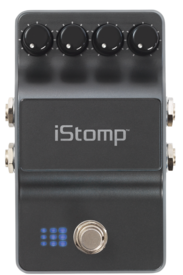 The Impossible Pedal uses two pitch shifters that are turned on and off in sequence to 'jump' between intervals on your guitar by simply pressing the iStomp footswitch. 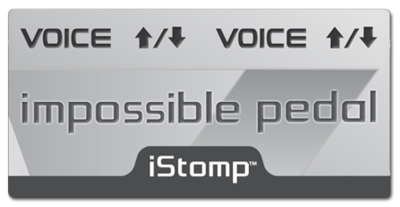 The pitch voices can be above or below the input note allowing for inhuman melodic runs. 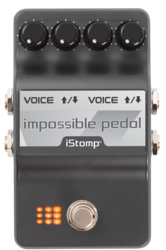 Inspired by Adrian's use of the DigiTech HM-2 HarmonyMan, The Impossible Pedal will make your next solo a real head turner! VOICE - Selects the first pitch interval. 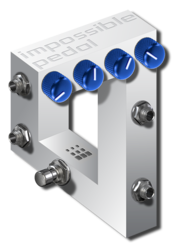 DOWN/UP - Controls the first pitch shift direction. VOICE - Selects the second pitch interval. DOWN/UP - Controls the second pitch shift direction.